Evolution to a cold, stormy winter is beginning. The most recent closest winters are 2002-03 and 2009-10. No change to the man setup first espoused back in August and then late September. Forecast made a bit colder for the heart of winter. Snowfall map honed a bit. The setup for this winter has been dealt with exhaustively in previous forecast packages. There is no use flogging a dead horse, as I am happy with our diagnosis. A new round of modeling will come out starting next week and we have not yet had the Euro do its usual flip-flop, as it has done on us before. Then again, we only see its seasonal forecast once a month, and the CFSv2 has been trying desperately to mimic the non-winters of 2001-02 and 2011-12. Given they are antilogs with SSTs and solar activity, it seems kind of hard to believe. The El Niño, including the type we envisioned using the SOI theory from the previous winter, is evolving. Cold water remains to the west of Australia, which would tend to discourage a major jaunt into the warm phases of the MJO that produce a lot of convection there and something associated with a large scale warm pattern across the U.S. The warm pool in the North Pacific that we jumped on in 2013-14 and 2014-15 is something that is there, too. Nino3.4 in the central Pacific looks to be warmer than Nino1+2 in the eastern Pacific. There are a lot of markers for a cold winter here. This outlook is short on explanations since we have gone over the ideas in detail in previous discussions. I still feel we have a good reason to suspect a long, cold winter is evolving. 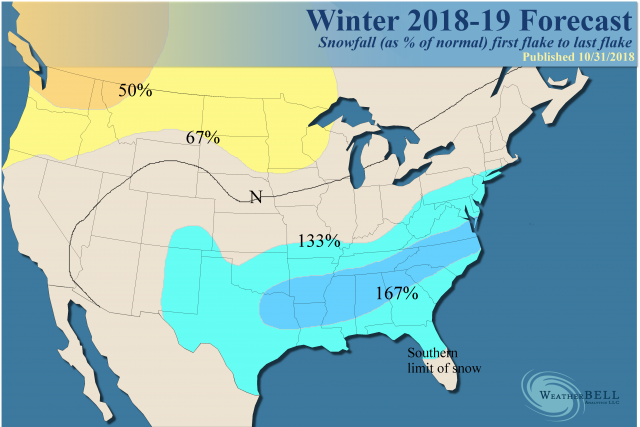 The evolution of the winter pattern will be strongly dependent on the development of the trough in the Pacific from near the Dateline to near 150°W to the south of Alaska. This should leave a trough over the eastern part of the U.S. for the heart of the winter. The closest analogs since the turn of the century are 2002-03 and 2009-10, so we are following that kind of analog into the early winter months. 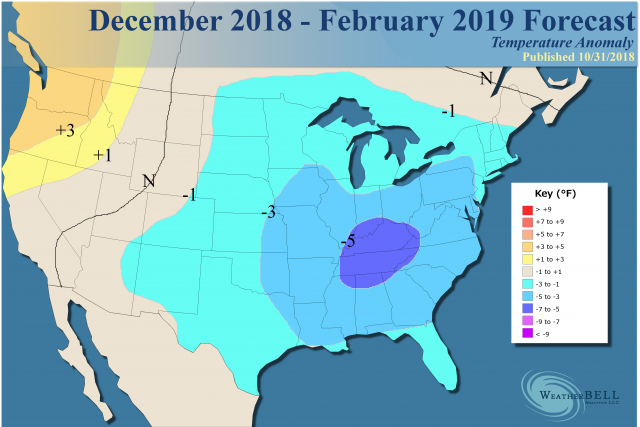 The bottom line is the next 6 months should average below normal with the deepest of the cold relative to averages in January and February, but cold lasting well into the spring again.